FIRST. YAY. Don't know what to actually say now though. er nice french try. After hearing so much about it, was great to finally see footage of Gregor Townsend's little reverse pass (the Tooney Flip) to Gavin Hastings. Sweet. But why did the 90's segment stop with the 1995 Championship? Figured they would also want to spotlight 1999 with Scott Gibb's late try for Wales. Sorry England. Refreshing nice vid. Thanks RD. I think we should all agree RugbyDump is the best website on Earth!!! what was the song for 1984? Just great running rugby! 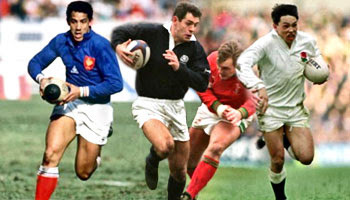 Today's pro players are certainly finer athletes than in this era but are they better rugby players? Discuss! That Blanco try was stunning. Surprised I haven't heard about it before, what a kick. "But why did the 90's segment stop with the 1995 Championship? Figured they would also want to spotlight 1999 with Scott Gibb's late try for Wales. Sorry England." BBC thought Will Carling leading England to 3 grand slams in the decade was more important, especially when they hadn't won one since 1980 before that stampede of grand slams. also, some of the images of that period; bill beaumont getting chair-lifted out of Murreyfield after winning clinching grand slam on scottish soil, the 2 scottish grand slams, serge blanco and french flair; upsets anything i've witnessed in american sports in my 21 years on earth besides seeing the red sox win the world series. rehanb, go back to your mud hut. And what about the two consecutives Grand Slams for the frenchs in 97 & 98??? serge blanco is a legend ! Nice french try!! !